We have years of experience in laying patterned carpets, commercial and residential installations, custom made carpets and bespoke rugs. 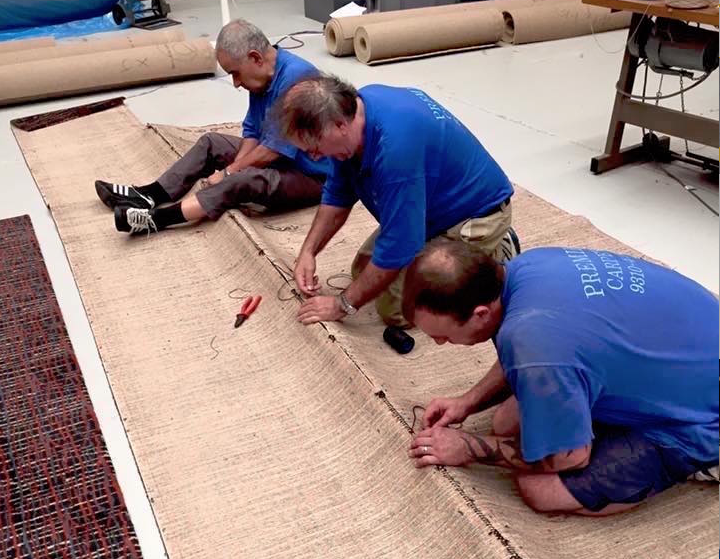 Premier Carpets is proud to be recognised as one of the few Australian installers that still practice the art of hand and machine sewing of woven carpets in joins to guarantee a smoother finish. Bespoke Carpets – Quality custom made carpets are individual and unique to themselves, providing you with the flexibility of effect, texture and colour for both domestic and commercial applications. Whether you require a specific colour to colour match home décor or want a distinctive pattern for corporate installation we can customise your carpet to suit your design project. Bespoke Rugs – Premier Carpets provide custom made rug options in order keep the integrity of the interior design, dimension, shape and fibre best suited for your individual space. We can design your rug in your choice of texture, colour or height, choice of bevelling or plain and different finishes – the choice is yours. Whether you are seeking rugs for residential rooms, hall, stairs or commercial environments Premier Carpets will assist you create the appropriate rug to define your interior design. Our fully trained sales consultants have a wealth of knowledge and experience and will assist you in selecting the right carpet fibre, texture and colour for your home and lifestyle needs. Premier Carpets provides sample loans allowing the convenience of visualising the carpets you have selected in your own home. Your homes natural light, wall colourings, furnishings and internal and external surroundings will influence the look and colour of your selection assisting you in making your decision. Our Estimators will come to your home at a time that's convenient for you and take precise measurements of each room. Their expertise will ensure detailed plans incorporating all your specific requirement to provide an accurate quotation and ensuring a perfect installation. Premier Carpets can design and manufacture of custom carpets for bespoke designs. Premier Carpets is happy to demonstrate our tender abilities and showcase the necessary skills, resources, experience, financial capacity, and licences, accreditations, to fulfil the tender requirements. Premier Carpets can take up, remove and dispose of your existing flooring in preparation for the installation of your new selection. Although are carpet installers are not professional removalists, they will take the utmost care in moving furniture in preparation of room installation. However, billiard tables, pianos and other heavy or delicate items may require specialised professionals to move pre and post installation. Our trained professional installers bring craftsmanship and precision to your flooring installation paying attention to detail to ensure the best possible finish. Our installers are artisans that take pride in their work. Installing both residential and commercial premises they pay meticulous attention to details such as subfloor preparation, floor levels, uneven walls, ramping, stairs, pattern matching, power stretching and overall carpet fitting. Premier Carpets have built a reputation of trust, professionalism and reliability contributing to their large portfolio of high-end installation for exclusive homes and establishments that only highly qualified installers could accomplish. Our overlocking services include cutting to shape, overlocking, flatstrapping (tapering of sides), material edging (cotton, jute or microsuede) in addition to non slip underlay providing an attractive finish to all mats, rugs or runners. We can provide professional assistance in patching or repairing damaged carpet including re-laying and re-stretching of existing carpet. To protect your investment and your health, carpets need to vacuumed regularly and be professionally cleaned for optimum performance. Annual professional cleaning will remove bacteria, fungus, soils and allergens that will help extend the life of your carpet and protect your health. Patterned carpet adds a dramatic visual impact in interior areas and offers unlimited design possibilities. In addition to pleasing aesthetics, patterns offer the benefit of hiding soil. For these reasons, patterned carpet is growing in popularity for residential and commercial use. It does, however, present a challenge to the installer. Most manufacturers provide established tolerances and specific installation instructions for their patterned goods. However, most do not guarantee an exact pattern match. Premier Carpets skilled, responsible, and competent craftsmen have years of experience in the installation of patterned carpets and have effectively made adjustments within the manufacturer’s tolerances to provide successful installations that we are renowned for. Carpets have always provided warmth, comfort and durability and now come in a diverse range of colours, patterns, textures and fibres. Premier Carpets will provide you with the right information and advise to assist you balance style requirements and practical considerations such as traffic, maintenance and budget, ensuring we match your needs with your lifestyle. Residential flooring is designed with comfort in mind. Our large selection of beautiful options offer aesthetics while providing great underfoot comfort. Residential carpeting typically has taller pile and a fairly loose loop design. Both of these in conjunction with a high quality underlay for support and performance will produce the comfort that homeowners want from their flooring. Premier Carpets quality flooring options can create the right atmosphere, quality and performance that will create the right aesthetic for patrons, members, guests and staff. As commercial flooring professionals we offer the best commercial brands installed professionally to achieve the proper balance between ambience and performance. Durability and economy are high priorities when considering commercial flooring. Businesses experience higher foot traffic, so its flooring needs to be able to take the punishment. Commercial carpets generally have a short pile and tight looping allowing it to spring back under pressure. Commercial carpets are usually installed using direct stick or double stick method to ensure minimal movement and greater durability in both broadloom and carpet tile options in a great array of colours and designs. We can create positive impressions for all your commercial projects. Premier Carpets is one of the few Australia carpet installers that still practice the art of hand and machine sewing woven carpets joins, to guarantee a smoother finish. Sewing carpet joins provides durability and longevity of woven carpets ensuring your luxurious investment will perform under the heaviest of foot traffic. Hot-melt seam tapes do not always penetrate tightly woven carpets and will consequently allow the seams to fray and unravel. Premier Carpets is proud to be using the craft of sewing woven carpet joins, an art that has all but disappeared within the flooring industry. As the name suggests, Premier Pad was created specifically for Premier Carpets, an environmentally friendly, high rated performance pad underlay. Premier Pad is consistent in its density and thickness (14.5 mm) and is suitable for domestic flooring to heavy duty commercial flooring applications. Premier Pad underlay ensures that customers get comfort, quality and the maximum life out of their carpets. This product is a totally new environmentally friendly rated high performance pad underlay produced on state of the art manufacturing machinery. 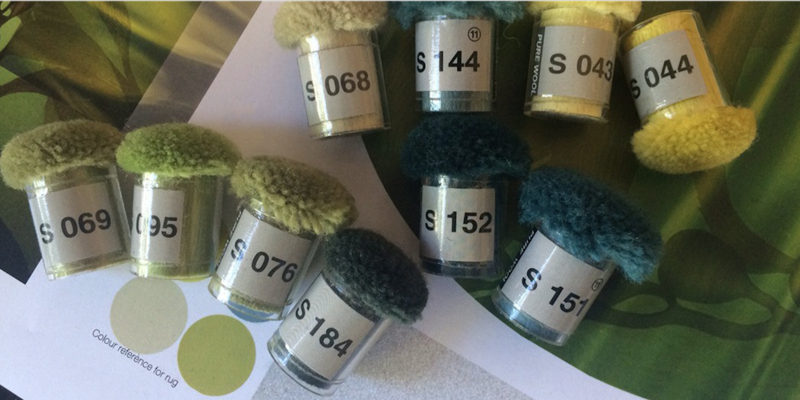 It is needled using recycled textiles with a 30% wool component for high performance values related to fire propagation tests - AS2404.